The Dash Ensemble in Crawl: Chapter 4. Photo by Chelsea Robin Lee. 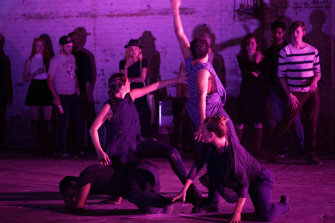 BOTTOM LINE: This show elevates site-specific dance to a new level and makes it feel organic to see dance this way. Crawl: Chapter 4 was innovative and a fun exploration to seeing dance in a new context. A barren parking garage with a few rows of seats felt more like a club scene than a dance performance. The doors were left open the entire evening and passersby could gaze in and see the crowd circling the warehouse following the movement in whichever direction it led them. The dancing was kicked off with a female solo lit by the headlights of a car in Dante Brown’s Soapbox. Everyone crowded around the entrance hoping to see the dancing and just when everyone got settled in, the dancers got into the car and drove away. One by one as the car traversed from one side of the warehouse to the other, the dancers spilled out in breathtaking slow motion. This moment was stunning and felt like it could have made a beautiful car commercial. The audience was corralled by the car. In the next section, the dancers swept the space with a broom to delineate the performance space, but the amount of dust put into the air in the venue actually felt a little unsafe to be breathing in. Otherwise, an intimate male duet where one was continuously apologizing felt raw and masculine. It was by far the strongest moment of the piece. Just as this stood out because of the voice filling the space, a lot of other famous singers' voices were lip-synced to. I am not sure if this was meant to be a segue to the second and third halves of the evening which were spoken word. Dante Brown, the choreographer himself, is a lithe mover who daringly leaps and bounds across the space as he lip-syncs to Elvis. In a less successful moment, another strong female dancer mouthed the song, “You’re Gonna Love Me,” while being petted the entire time by the rest of the women. The next segment was E. OK, a freestyle rapper who had a lot to say, but it felt like stream on consciousness banter for the first half of it. At the start of the evening, the audience was asked to participate by answering some questions, one of them being, “What do we pretend to be?” While I was eagerly awaiting a climax of everyone’s ideas coming together, all I heard was a haphazard interpretation of single one-line lyrics set to incredibly improvised jazz music. He never thanked or credited the four musicians and singer while they so effortlessly supported his vocals. At one point, he said he was just going to improvise the rest of the piece. E. OK might have served better as an emcee to the event. I appreciated the mixed mediums. In the beginning there were projections, and it seemed like this section would have been improved by a film or more projections for more light and visual interest in such a dark space. The third and final section of the evening was danced by Gregory Dolbashian’s, The Dash Ensemble. It was beautifully danced as the performers bent into shapes that were impossible, yet organic. The dancing in this section was the most exquisite of the evening. They bent fearlessly backwards into contorted positions and made jerky movements look like a piece of cake. A monologue was spoken throughout, but as the dancers kept shifting from one side of the room to the other, I felt myself more frustrated with navigating the audience members than observing the incredible movement that was happening. It would have been interesting to make that struggle a part of the piece, but I literally couldn’t see and it felt a little predictable as I think we circled a few times in the same sort of pattern like a herd. I also would have liked to focus on the words and circle around Dolbashian who was speaking. His voice was powerful and it would have been cool to see the dancers come closer to his physical body instead of feeling like a voice in the distance. Overall, it was a great format for site specific dance, and I give them kudos for trying to add in new elements. In such an artfully visual show, the actual spoken word section paled in comparison to the dancing elements. That did make everyone hungrier for more dance like this.